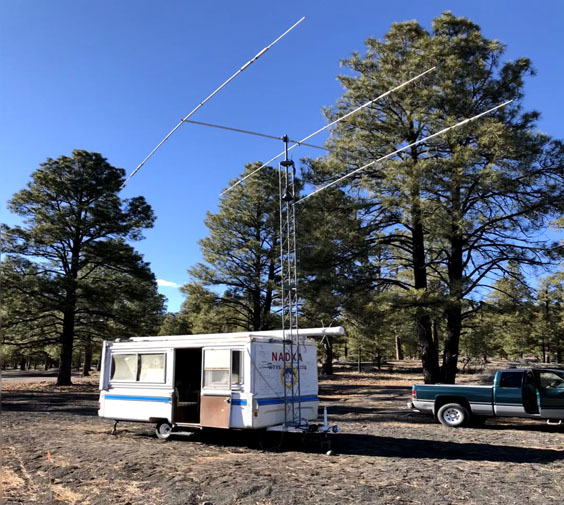 The Northern Arizona DX Associatio will be participating in Flagstaff, Arizona's 2019 "Lunar Legacy" celebration. "Every astronaut that stepped on the moon, trained in Flagstaff and the surrounding area." We will join in the celebration and hold Lunar Legacy Special Events throughout the year, including operating from those training locations like Lowell Observatory, where the astronauts used the 24" Clark Telescope to study the moon. Here, they worked with NASA and the USGS looking for and mapping potential moon landing sites. Also, we will be at Sunset Crater just outside Flagstaff where they have volcanic cinder hills. Here, dynamite was used to create craters and make a replica of two of the possible moon landing sites. Then they brought in the lunar rover for the astronauts to drive and get a feel for what it might be like on the moon. Another place the the astronauts trained was at Meteor Crater, Arizona. During 2019, our club (NADXA) will set up and operate from this mile-wide crater, again where the astronauts trained. According to Dwayne Vigant, general manager of Meteor Crater National Landmark, it was here that the astronauts had an early wardrobe malfunction when the men tore holes in theeir space suits on some of the crater's rocks, which required NASA to redesign their space suits. Then the astronauts visited the Grand Canyon to study the geologic formations to prepare for the moon visits. We will be setting up operations at the GC National Park sometime during the year. One of our NADXA members, WW4A, who lives and works at the GC Park will cordinate this event. 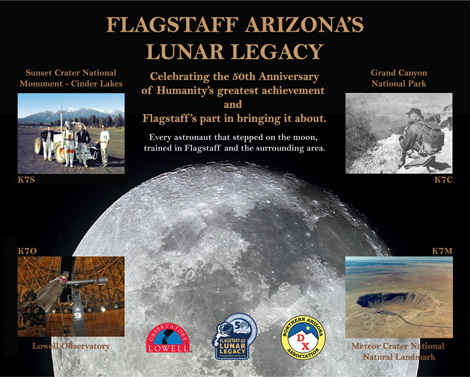 Look for our Lunar Legacy special event call during 2019 while we operate from Lowell Observatory, Sunset Crater National Monument, Meteor Crater National Natural Landmark, and Grand Canyon National Park. We have special QSL cards made up for the event. Also, an optional high quality certificate with memorable Lunar Legacy photos and information will be availablefor a small fee. Both of these will look great on your wall!! We sure hope to work you during the Lunar Legacy event! Lunar Legacy certificates suitable for framing (8"x10") are available for $5 from the LL QSL Manager below. Endorsement stickers will come along with QSLs. QSL cards are available from each of the four stations we will operate. Send your QSL and a SASE or $2 to the address below. The gold seal endorsement stickers for the certificate will be returned to you along with our QSL card. 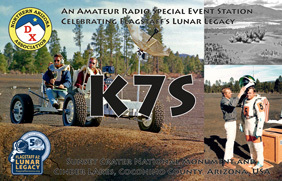 The NADXA radio association is sponsoring a special event radio stations for the celebration of the events that took place around Flagstaff in preperation for the moon landing. 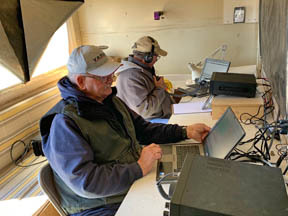 We will be working most bands as propagation permits. Check the internet spotting sites for exact frequencies. 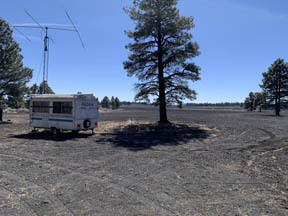 K7S will be on the air March 16 - March 30, 2019 and we will be on location from March 16 - 17 at Cinder Lake, near Sunset Crater, where the astronauts actually trained. Please feel free to visit the site and operate if you like. 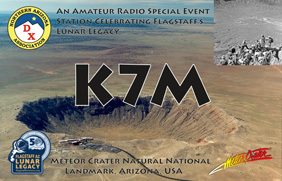 K7M will be on the air March 30 - April 13 and April 22 - May 3, 2019 and we will be on location April 6 - 7 and 27 - 28, 2019 at Meteor Crater where the astronauts actually trained. Please feel free to visit the site and operate if you like. 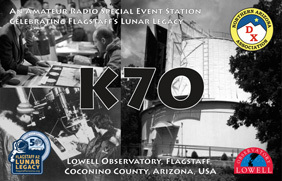 K7O will be on the air July 20 - August 3, 2019 and we will be on location July 20 - 21 at the Observatory where the 24 inch telescope was used to observe and select the exact landing location. Please feel free to visit the site and operate if you like. 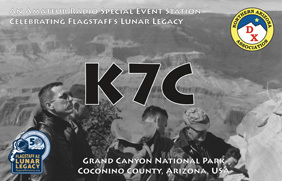 K7C will be on the air August 24 - September 1, 2019 and we will be on location August 24 - 25 at the Grand Canyon where the astronauts trained. Please feel free to visit the site and operate if you like.